Are There Drinks That Make You Look Younger? A woman is pouring green tea. It’s true: Consuming certain drinks on a regular basis can prevent premature aging and keep your skin taut and wrinkle-free. Several factors contribute to aging, such as inflammation, sun damage, and free-radical oxidation that damages cells and tissues. While there’s no shortage of products on the market that help you look younger, you can also drink nutritious beverages that have anti-aging benefits. A favorite with vegetarians and vegans, soy drinks or beverages have proven skin-care benefits, according to Robert Baran and Howard I. Maibach, authors of the “Textbook of Cosmetic Dermatology.” Soy comes from the soybean plant, which is a member of the pea family. It’s been used for centuries for a variety of health reasons, including keeping skin healthy. 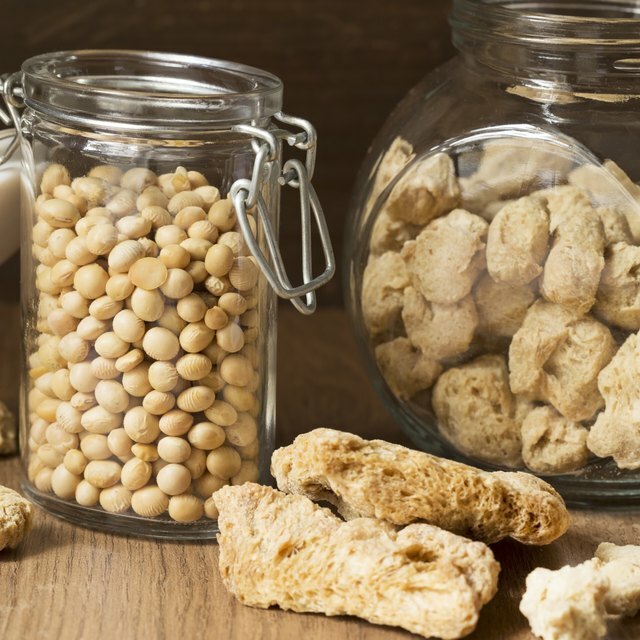 Soy contains compounds called isoflavones, which have weak antioxidant properties and help to destroy free radicals that attack the skin, explain Baran and Maibach. Isoflavones also have anti-inflammatory properties. Both antoxidants and anti-inflammatories help to reduce aging associated with UV exposure. Soy also contains phytoesterols that moisturize the skin and prevent redness caused by sun damage. Drinks made with soy include soy milk, or smoothies and shakes made with soy milk. This blue-green algae is loaded with antioxidant nutrients such as carotenoids, vitamin E and selenium. Skin consists primarily of the proteins collagen and elastin, which break down as you age. Spirulina is one of the richest sources of protein, and selenium is essential for protein synthesis, states the American Academy of Anti-Aging Medicine. Skin dryness contributes to premature aging and signs such as wrinkles and saggy skin. However, spirulina contains the essential fatty acid gamma linoleic acid, which helps to keep your skin moist. Furthermore, in two animal studies conducted in 2002 at the University of South Florida Center for Aging and Brain Repair, spirulina was able to reverse changes in the body that are usually linked to aging. Spirulina is available in powder form that you can mix into a drink, smoothie or in liquid extract form. A staple in Asia for centuries, green tea is made from unfermented tea leaves and well-known for its high levels of antioxidant polyphenols. According to the University of Maryland Medical Center, the polyphenols in green tea are more potent than those found in vitamin C. A study published in the journal “Photochemistry and Photobiology” revealed that green tea prevents free radicals from generating in the skin when sun damage occurs and reduces ultraviolet-related inflammation. Drink a few cups of green tea each day to rejuvenate your skin. Adequate water intake is of utmost importance for younger looking skin. A report from the University of Wisconsin School of Medicine and Public Health states that water intake prevents skin dryness by preventing dehydration, and may also help prevent wrinkles. Even if you drink the traditionally recommended eight glasses of water per day, you should drink more. Water reaches and is used by your internal organs before it gets to your skin, so drinking extra will make sure there is enough to go around. Textbook of Cosmetic Dermatology: Robert Baran, et al. Are There Foods That Remove Stretch Marks?